A constant main-stay that I find in bar-room conversation is the ever-popular question: "When is the Sheraton ever going to open again?". Newly refurbished suites (they've fixed that smell problem!). A nice extra is each suite will have a flat panel TV (par for the course these days) and a PS3 to play with. There is a rumour I've heard a few times about the Chinese takeaway, I mean, night club that used to be in the basement of the Sheraton. When it was indicated that there was to be no more nightclub at the hotel, the "pimp" for all these hard working Chinese horizontal refreshment providers was, shall we say, put out? His primary place of business was being closed. 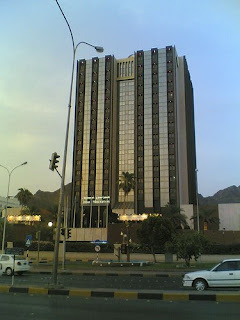 So the rumour goes, this unhappy turn of events so irked said "pimp" that his considerable Wasta muscles were flexed and the owners of The Sheraton building here in Oman were required to open a new bar (place of business) for the ladies of the night somewhere in Muscat. Anyway, The Sheraton will be opening in November, for HM's birthday. Even if the hotel isnt fully finshed. Welcome to the Omani bloggosphere - finally!!! - and I love the blog already. The Chinese takeaway was a bit of a landmark, until they moved into the car park outside and were sooo obvious Muscati commented how he couldn't believe the cops didn't bust them. They were then moved along... Good to know they will be back. Second to UD's congratulations and welcome. Always good to have another source of news! As for the Sheraton - everytime one passes, it looks worse, but it would be nice to have it back - seafood night! Muscato - it's a privilege to have you reading... I've always found your blog a great little respite from the daily grind... As for the Sheraton, it'll start looking better soon, I promise.... ;) Oh, and it'll feature a new restaurant or three for you to try. For me, November deadline looks impossible -- at least the way work has been progressing all these years/months. KC - It's entirely possible - the tower is effectively complete, its just ground floor works that need to be done. It wont be 100% open for sure, but it's achievable. I was going to ask if the hookers would be back, and it looks like there is a high chance. Think we'll give the grand re-opening a miss! Jamilla Camel - Sorry I dont follow you? There is absolutely no chance of the hookers being back at The Sheraton - The owners have gotten rid of the night club that they used to hang out at. I was just going through some of your earliest blogs and found this one on the sheraton!! that was written in 2009. now half of year 2012 is nearly over and sheraton still remains closed. wonder when will this ever get to open!! I don't think it'll ever open, owners need more money to finish it. Way too late.. but last i heard, Sheraton is sold to the lulu group. I might be wrong but would actually want to know what is happening with the tallest hotel in Muscat.